Today, we have a guest blog from Sandra, one of RSPB Scotland's Lifelong Learning Officers in Glasgow. The rewards of my job are the amazing people - young and older - and the wonders of nature. No two days are the same, which is great, as I can create and engage in new creative learning opportunities, and revisit others. Recently my job has taken me to Kelvingrove Park, Glasgow schools, the Big Nature Festival in Musselburgh, a Radio Scotland interview and (very soon) the Glasgow Wildlife Garden Festival. Often, it is the small beautiful moments of simply sharing in the joy of nature with children and families; that moment when awe and wonder are captured in a gentle smile and a ponderous question or in the twinkling of an eye. "I know what they are!" Most children in the class were confident in this wildflower ID. ”My auntie makes bracelets with them for us,” was another comment. “They make me smile,” said another. 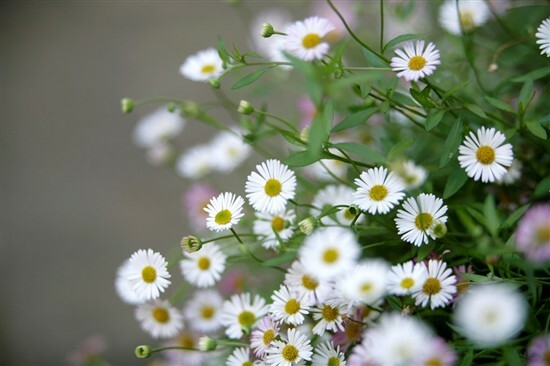 Many children think of the common daisy as their own. With some park grass now not mown to within a millimetre of its life, they can experience wildflowers if they have access to a local park or garden or nature reserve. We talked the science of the plant, some daisy songs they knew (and some we created), gardening for wildlife theories and creative daisy ideas. Other daisy names we discovered were: benner gowan, bone flower, bruisewort, ewe gowan, goose flower and noon flower. They were fascinated by my tales of daisy chains when I was a child (“You were a wee girl!”) and as a student making daisy chains in the Edinburgh Botanic Gardens eons ago. We discovered two methods: the braid, and the thread method. Which have you tried? 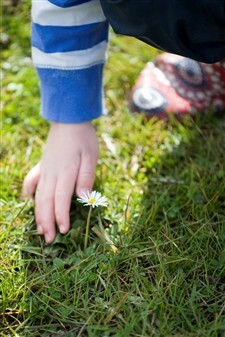 Why not try to make your own daisy chains, but remember to leave plenty of flowers for wildlife and nature too. Make a picture with recycled materials for a friend or as a thank you. Recycle and paint a paper towel inner tube to make daisy petals. Lay flat on a card or ‘plant’ in pots inside. Make a picture frame with daisy shapes. Or why not get messy and finger print petals? Any minibeasts on the flower? Look at these with a magnifying glass, but leave the plant untouched. Find out what happens to the flowers at night. Count how many daisies you can see in a field in one minute! Or be more scientific and use a metre quadrat. Repeat in sunny and shady spots. What do you notice? Paint plant pots with daisy designs. Daisy.. .for the love of you! Enjoy your nature filled summer. See you at the Glasgow Wildlife Garden Festival!